A moving story about a deaf young woman, illustrated in Kovács’ edgy and amusing style. Kamilee, who lost her hearing at a young age, finds herself on an adventure to discover the deep dark secrets of a customer in a bird shop. Just what kind of labyrinth has she stepped into? And what kind of connections lurk in the places unseen? A captivating graphic novel about what a person is prepared to do to preserve an important relationship, the weapons love can give and the traces the past leaves behind. 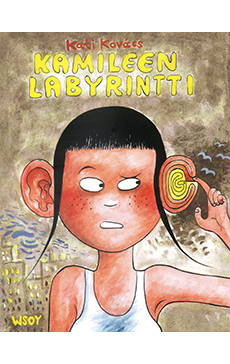 Kati Kovács, whose drawings have a trademark naïve style, is one of Finland’s best-known graphic novelists.